The anti-inflammatory and antipyretic activities of β-sitosterol, isolated from the plant Cyperus rotundus has been studied, employing carrageenin induced oedema, cotton pellet implantation and Brewer's yeast induced pyrexia in rats. 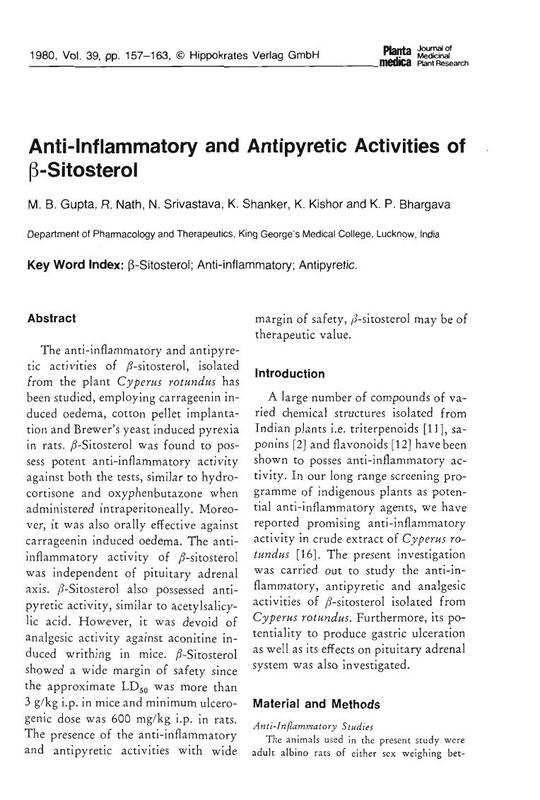 β-Sitosterol was found to possess potent anti-inflammatory activity against both the tests, similar to hydrocortisone and oxyphenbutazone when administered intraperitoneally. Moreover, it was also orally effective against carrageenin induced oedema. The antiinflammatory activity of β-sitosterol was independent of pituitary adrenal axis. β-Sitosterol also possessed antipyretic activity, similar to acetylsalicylic acid. However, it was devoid of analgesic activity against aconitine induced writhing in mice. β-Sitosterol showed a wide margin of safety since the approximate LD50 was more than 3 g/kg i.p. in mice and minimum ulcerogenic dose was 600 mg/kg i.p. in rats. The presence of the anti-inflammatory and antipyretic activities with wide margin of safety, β-sitosterol may be of therapeutic value. (3-Sitosterol - Anti-inflammatory - Antipyretic.